Ottamthullal is a type of performing art in Kerala State of India. 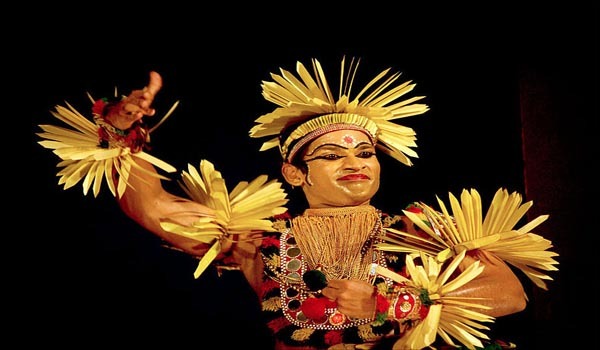 Legendary Malayalam poet Kalakkaththu Kunchan Nambiar created this dance form in 18th century.In thullal the performer himself sings and says the story. The troop which accompanies the main artist repeats the same when each sentence is completed. This highly stylized type of performing art from was created in 18th century. Kunchan Nambiar, who was playing the mizhavu for a Chakyar Koothu show, dozed off in the middle of the performance, thus inviting ridicule from the Chakyar. The humiliated Nambiar vowed to come up with an alternative art form to Chakyar koothu, and conjured up an Ottamthullal show that also made fun of prevalent socio-political equations and prejudices of the region. The precise interpretation of the labels Seethankan, Parayan and Ottan is not clear, but the difference in the styles relates mainly to the meter of the poetry, the place of the singing, and the costume and adornment of the performer. Ottamthullal, over the centuries, has a (mostly) single actor, donning a green make-up and wearing colorful costumes and reciting the thullal lyrics (dance songs), all the while acting and dancing himself.Pandit Jawaharlal Nehru once remarked that Ottamthullal is “poor man’s Kathakali“. The art form has of late found practitioners from among women too, and is occasionally staged as a group dance form with each artiste representing a character in the story play.Ottamthullal is very satirical touch. Ottamthullal performing artist has the freedom to improvise and incorporate humour. For Ottamthullal, the instruments used are the cymbals and the Maddalam.